I want to split my stereo input channels so I can Eq one of them. They both would then go to the built-in output. 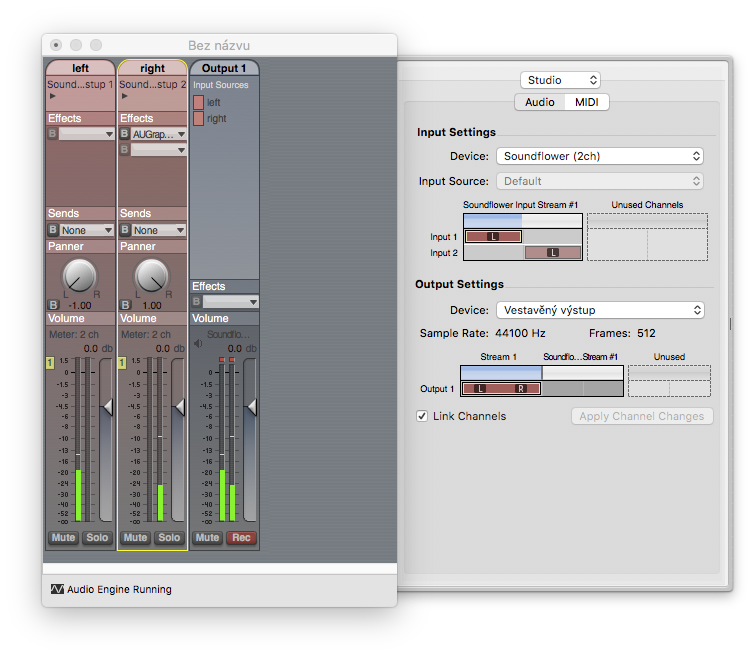 I've installed SoundFloser and AU Lab on Mac OS 10.12 Sierra. I've read through the help pages for AU lab. I couldn't find anything specific to my need. With all the options, it looks like it should be possible. 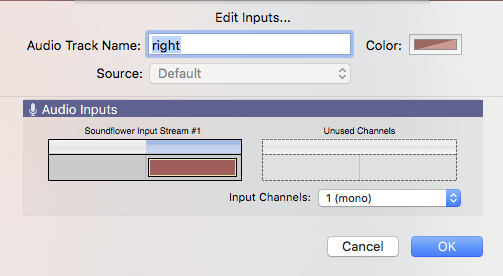 I've tried selecting two mono inputs. I get two left channels as input. I didn't see any way to change the source of the mono input, but I could have missed it. I could be done using Rogue Amoeba's Audio Hijack which is ostensibly an audio recorder but has really comprehensive routing capabilities too. You build your path just by drag & drop, it makes the connections for you. Route a source to two different Channels plugins, kill left in one & kill right in the other - that way each will pass only a single side of the stereo pair. In front of that you put two EQ plugins, then route both to a single output, headphones/speakers etc. It's fairly expensive for a one-trick pony, but it's extremely useful if you need the trick it can do. BTW, remember to switch it on once you've built it ;-) Button bottom left goes white & the numbers go orange & start to count time. As a side-effect, launching any specific Hijack preset will launch any apps assigned to it. Indeed you can split stereo input with Soundflower and AU Lab and apply an effect on one channel only. configure Output Settings in Studio ⇧⌘I if necessary. Not the answer you're looking for? Browse other questions tagged audio . Is it possible to play one song through speakers, and another through headphones/earbuds? How to control L/R audio balance for apps separately? How can I force Mac OS X to treat my Mackie Onyx Blackjack as a mono input device? 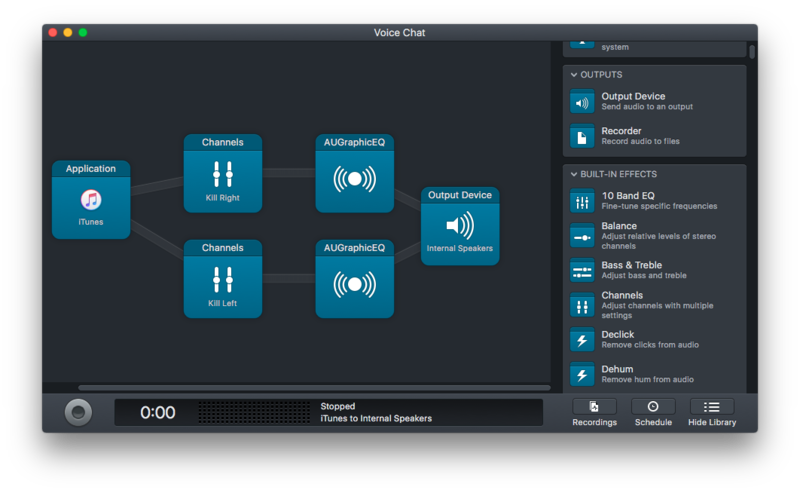 Use a USB sound card with multiple input lines in apps like Skype or Dictation? Can I connect a microphone to a retina 5k iMac?